Scientists studying a ‘twin’ of the Milky Way have used the W. M. Keck Observatory and Subaru Observatory to accurately model how it is swallowing another, smaller galaxy. Their findings have opened the way to a better understanding of how structure forms in the universe and are being published in the Monthly Notices of the Royal Astronomical Society this week. The work, led by Caroline Foster of the Australian Astronomical Observatory, has used the Umbrella (NGC 4651) galaxy to reveal insights in galactic behavior. The Umbrella lies 62 million light-years away, in the northern constellation of Coma Berenices. Its faint parasol is composed of a stellar stream, thought to be the remnants of a smaller galaxy being pulled apart by the large galaxy’s intense gravitational field. The Umbrella will eventually absorb this small galaxy completely. The merging of small galaxies into larger ones is common throughout the universe, but because the shredded galaxies are so faint it has been hard to extract details in three-dimensions about how such mergers proceed. ESA’s Rosetta spacecraft has found that comet 67P/Churyumov–Gerasimenko is releasing the equivalent of two small glasses of water into space every second, even at a cold 583 million kilometres from the Sun. The first observations of water vapour streaming from the comet were made by the Microwave Instrument for Rosetta Orbiter, or MIRO, on 6 June, when the spacecraft was about 350 000 kilometres from the comet. Since the initial detection, water vapour has been found every time MIRO has been pointed towards the comet. “We always knew we would see water vapour outgassing from the comet, but we were surprised at how early we detected it,” says Sam Gulkis, the instrument’s principal investigator at NASA’s Jet Propulsion Laboratory in Pasadena, California, USA. ESA has selected the Athena advanced telescope for high-energy astrophysics as its second ‘Large-class’ science mission. The observatory will study the hot and energetic Universe and takes the ‘L2’ slot in ESA’s Cosmic Vision 2015–25 plan, with a launch foreseen in 2028. By combining a large X-ray telescope with state-of-the-art scientific instruments, Athena will address key questions in astrophysics, including: how and why does ordinary matter assemble into the galaxies and galactic clusters that we see today? How do black holes grow and influence their surroundings? Scientists believe that black holes lurk at the centre of almost all galaxies and that they play a fundamental role in their formation and evolution. NASA’s Mars Curiosity Rover has completed a Martian year –687 Earth days– this week. The vehicle travels through an arid and reddish landscape that was home to glaciers in the past. Ancient Mars held large quantities of water, yet its global hydro-geological cycles were very cold, so much so that they induced the presence of a giant ocean, partially ice-covered and rimmed by glaciers on the lower plains of the northern hemisphere. Now, an international team of researchers has confirmed this global picture locally, on the Martian site where Curiosity is roving: Gale crater. “This crater was covered by glaciers approximately 3,500 million years ago, which were particularly extensive on its central mound, Aeolis Mons” points to SINC the lead investigator of the study Alberto Fairén, from the Centro de Astrobiología (INTA-CSIC) in Spain and Cornell University in the USA. 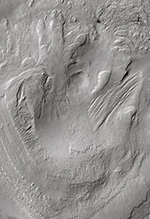 “However, at that time there were also rivers and lakes with very cold liquid water in the lower-lying areas within the crater,” adds the researcher, who highlights the fact that ancient Mars was capable of “maintaining large quantities of liquid water (an essential element for life) at the same time that giant ice sheets covered extensive regions of its surface”. Astronomers have discovered three closely orbiting supermassive black holes in a galaxy more than 4 billion light years away. This is the tightest trio of black holes known to date and is remarkable since most galaxies have just one at their centre (usually with a mass between 1 million to 10 billion times that of the Sun). The discovery suggests that these closely packed supermassive black holes are far more common than previously thought. The team, led by South African Dr Roger Deane from the University of Cape Town, used a technique called Very Long Baseline Interferometry (VLBI) to discover the inner two black holes of the triple system. This technique combines the signals from large radio antennas separated by up to 10 000 kilometres to see detail 50 times finer than that possible with the Hubble Space Telescope. The observations were done with the European VLBI Network (EVN) and the data were correlated at the Joint Institute for VLBI in Europe (JIVE) in Dwingeloo, the Netherlands. Credit: X-ray: NASA/CXC/SAO/E.Bulbul, et al. A mysterious X-ray signal has been found in a detailed study of galaxy clusters using NASA’s Chandra X-ray Observatory and ESA’s XMM-Newton. One intriguing possibility is that the X-rays are produced by the decay of sterile neutrinos, a type of particle that has been proposed as a candidate for dark matter. While holding exciting potential, these results must be confirmed with additional data to rule out other explanations and determine whether it is plausible that dark matter has been observed. Astronomers think dark matter constitutes 85% of the matter in the Universe, but does not emit or absorb light like “normal” matter such as protons, neutrons and electrons that make up the familiar elements observed in planets, stars, and galaxies. Because of this, scientists must use indirect methods to search for clues about dark matter. The latest results from Chandra and XMM-Newton consist of an unidentified X-ray emission line, that is, a spike of intensity at a very specific wavelength of X-ray light. 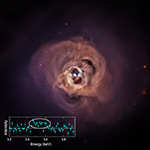 Astronomers detected this emission line in the Perseus galaxy cluster using both Chandra and XMM-Newton. They also found the line in a combined study of 73 other galaxy clusters with XMM-Newton. A combined NASA and European Space Agency (ESA)-funded study has found firm evidence that nitrogen in the atmosphere of Saturn’s moon Titan originated in conditions similar to the cold birthplace of the most ancient comets from the Oort cloud. The finding rules out the possibility that Titan’s building blocks formed within the warm disk of material thought to have surrounded the infant planet Saturn during its formation. The main implication of this new research is that Titan’s building blocks formed early in the solar system’s history, in the cold disk of gas and dust that formed the sun. This was also the birthplace of many comets, which retain a primitive, or largely unchanged, composition today.